When a participant (who has been invited to participate in the study) arrives at the site for their interview, a participant manager must receive them as explained in this section. You will have to assign a Participant ID number, the number that will be used to track the participant during the interview and, will probably be used to track their data for the duration of the study. It is important to review the list of participants carefully when registering a new participant and assigning them a Participant ID. 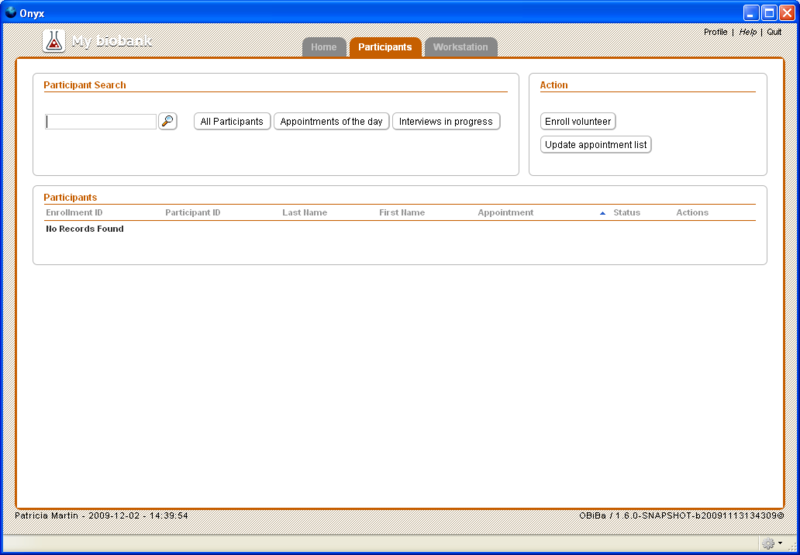 The appointment list should have been updated recently to ensure that the participant is in the Onyx database. See Updating the Appointment List. Each study determines how it will assign Participant IDs: either by scanning a barcode or by manually entering a number in a certain format and from a certain series of numbers. Search for the participant in any of the ways described in Finding a Participant. | After you find the participant, their name is displayed in Participants list and Receive appears in the Actions column for the participant. See this figure. Select the Receive link for the participant that you want to receive. The Participant Reception page is displayed. See this figure. If Onyx has been configured to generate participant identifiers, the Participant ID field will have a Generate ID button next to it. Check the information in the Participant Registration page with the participant and correct it, if necessary. Ensure that all required fields (marked with asterisks) are filled in. Fill in optional fields if the participant is willing to provide the information. The fields you see were defined by your study and may be different from those shown in this figure. Some fields are already completed with information that is in the appointment list. 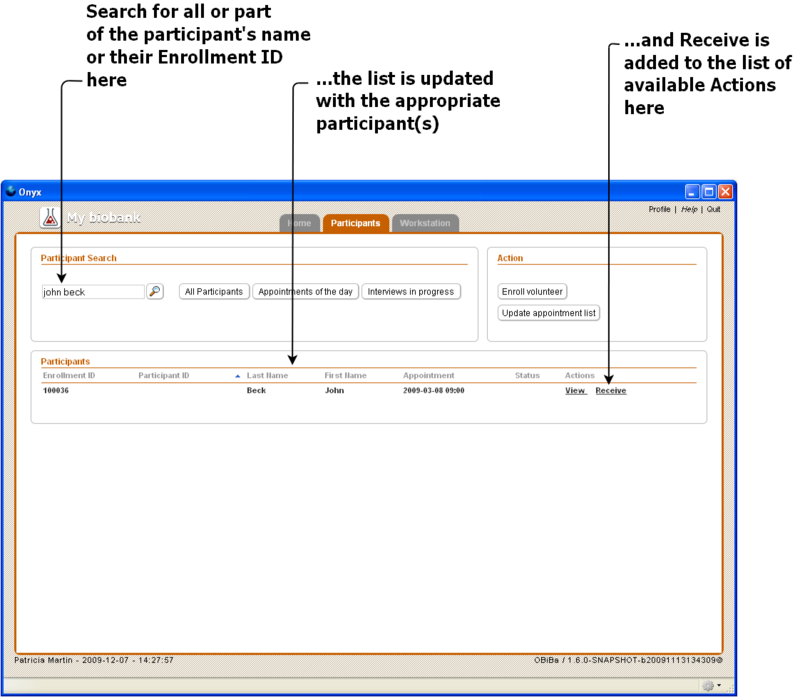 Certain key information (such as Enrollment ID in this figure) cannot be edited. 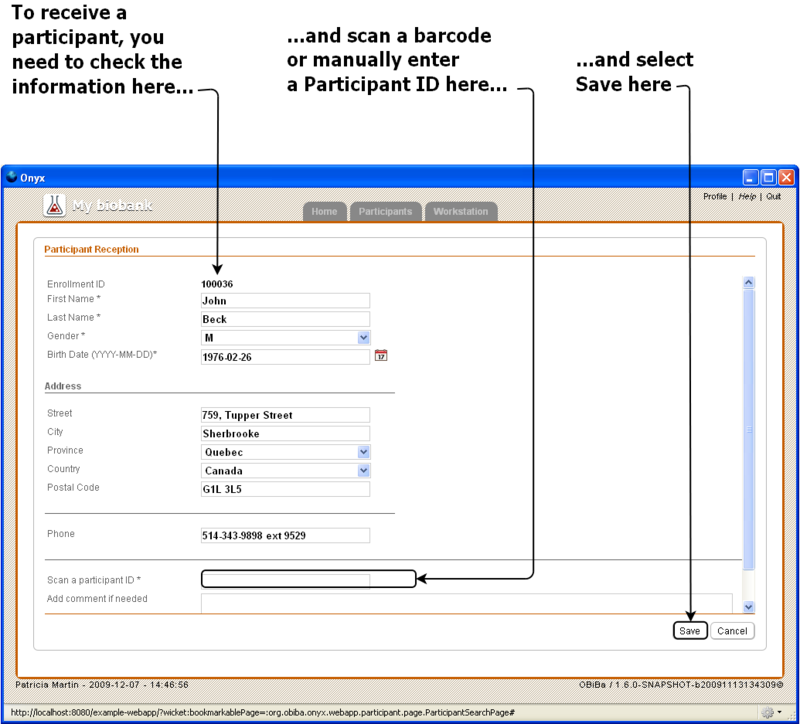 Assign a participant ID by scanning a new barcode or by entering a value manually in the Participant ID field. If you decide not to proceed with receiving the participant, select the Cancel button. The Participant Reception page closes and the Participants page is redisplayed unchanged. If you want to go ahead with receiving the participant, select the Save button. The Participant Reception page closes and the Participants page is redisplayed. The Status of the participant’s interview has been updated to In Progress and Interview has been added in the Actions column for the participant. See this figure. If there are several pages of participants in the list, you can step through the pages in the list or search for the participant in order to confirm the change in their status or start the interview. The participant can now be interviewed. 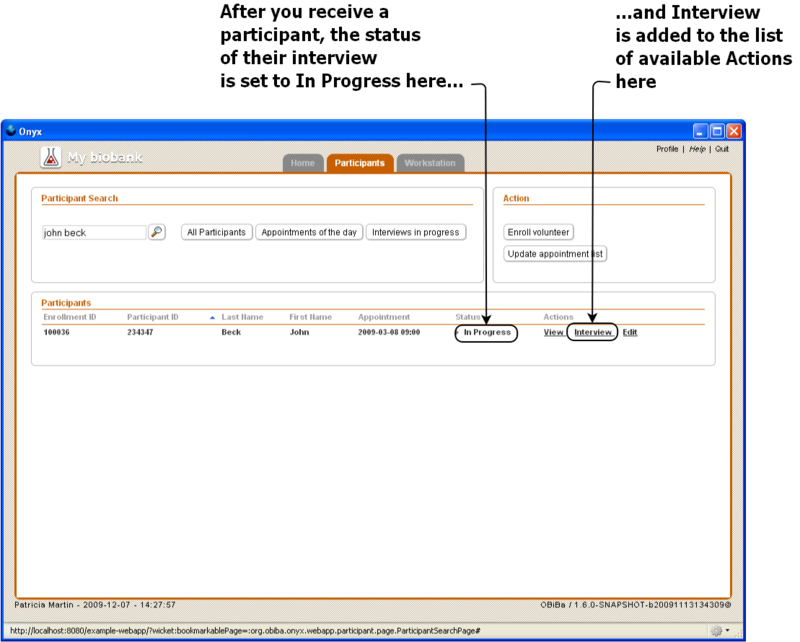 See The Simplest Way to Start an Interview or Entering the Interview page.